A new city is emerging against the snow-capped Tian Shan mountain range in the capital city of Urumqi of the northwest region in the People’s Republic of China (PRC). Flatbed trucks laden with steel beams and aluminum bars make deliveries to construction sites for new residential and office high-rise buildings. The State Council is behind transforming Urumqi to become a geostrategic transportation hub for the region and to revive routes to the west on the so-called ancient Silk Road. Xinjiang Uyghur Autonomous Region (XUAR) and its capital city Urumqi are marked as the center of Asia and the farthest city in the world by 1,600 miles from a sea - Bay of Bengal (Guinness Book of World Records). The remoteness and lower economic growth than the PRC’s eastern regions are causing the national government to improve living conditions, transportation access and business potential for the 3.5 million city inhabitants with a new central business district (CBD) project. The old cramped and dirty low rise communist compounds are yielding to the new city high-rise apartment and office developments twenty minutes away. A similar transformation began 13 years ago in Beijing with a new CBD. An important attraction to all residents, investors and tourists is the Hilton Urumqi opened in 2015 in the new CBD. A window view on the ninth floor counts 24 construction cranes dotting the city-scape. 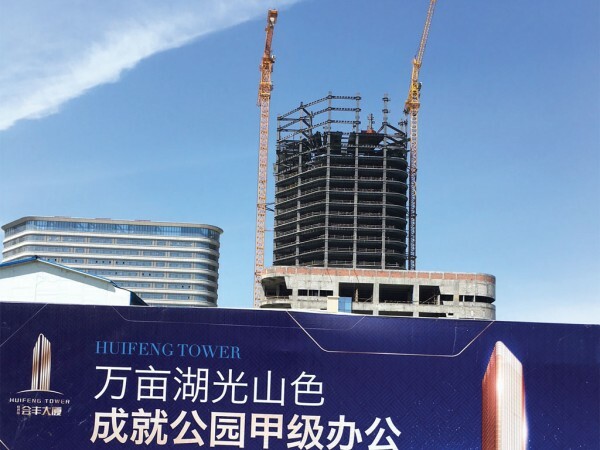 The Junfa Group is one of the real estate developers founded in Urumqi in 2007 responsible for the anchor Hilton hotel property and many nearby construction projects such as the Hong Guang Shan (mountain) scenic area and the Hong Guang Shan tower complex. In 2011, a new bus rapid transit (BRT) system opened with gleaming new buses moving people all over the city, a new high-speed rail terminus is opening to reduce travel time drastically throughout China and a new subway system will open its first line in 2019. Hong Guang Shan glass tower will be central to the new city plan. Hong Guang Shan glass tower will be central to the new city plan. Building materials include rolled steel and will have an exterior glass wall. “This thirty-four floors glass wall tower next to the Hilton will require a total of 11,000 tons of steel and normal construction period is within three years,” explained Mr. Zhu, project engineer in an on-site interview with the American Journal of Transportation. The steel beams are manufactured by Zhong Jin Steel Structure, a government enterprise, based in Xi’an city, Shaanxi province 1,569 miles from Urumqi. “Each truck can transport more than thirty tons of steel material at a time. It takes about five days by road from Xi’an northwest to Urumqi with about 14 hours driving per day,” he said. The individual steel beams structures are put on the trucks without fixing. Trucks carrying the steel beams arrive at the construction site for builders to erect 3-4 floors per month. Two cranes attached to the building frame hoist the steel beams from the ground to the 22nd floor where workmen tethered to a safety line fasten the new beams into place vertically and horizontally. Guangdong Installation based in southern China is one of the contractors on this site showing different areas of China contributing to the Urumqi new city development. The glass manufactured for the tower will be supplied by China’s southern glass group. Locally based Junfa Group is also involved in the nearby ecological landscaping of beds of roses and grape vineyards and the scenic area. The park allows residents and tourists to walk and drive around this enclosed area of the new city. Trucks carrying steel beams arrive at the construction site for builders to erect 3-4 floors per month. Urumqi and its “new city” is also planning to become a transportation hub for rail and road. Urumqi is strategically located for Central Asia and Europe trade in the national government’s (Central Asia Economic) Belt and (Maritime Silk) Road Initiative (BRI) to revive old trade routes known as the Silk Road. The land bridge is shorter, yet more expensive alternative to sea container traffic and Chinese factories’ exports far outnumber imports. In addition, the main minority Uyghurs trace roots to an ancient Turkic tribe (Caucasian/East Asian) and improving living and business opportunities are important to government leaders in preventing Central Asia extremist groups from operating in the region. Security concerns are evident everywhere in Urumqi. Less than one hour from Urumqi is the main rail interchange where PRC trains are assembled for domestic, cross-border (eight countries) and Europe shipments. 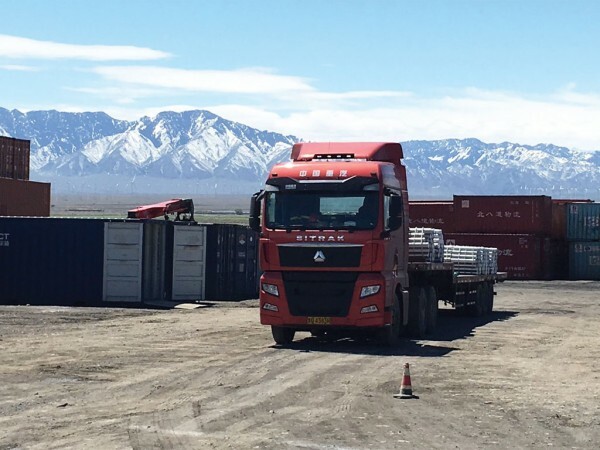 Enterprises from XUAR and all of China connect with this multimodal logistics park to ship cotton to mills and Xinjiang produced aluminum tubes trucked to Urumqi construction sites and for coal and various bulk trades bound for Kazakhstan, Russia and Europe. This is the main railway line of the region for consolidating, storing and through transit without on-site value-added services, yet and is the core to the BRI in Urumqi. Plans are to expand the facility of 10 million tons per year of 2-3 trains per day of 40 twenty equivalent unit (TEU) containers per train to ten trains per day in the 7–8 day journey to European markets. One Urumqi company is receiving 31 railcar trains of 10 new automobiles per car 1,900 miles from Chongqing’s Geely and Mazda manufacturers. These automobiles will be distributed throughout Xinjiang by truck carriers amounting to 150,000 autos per year and growing to 200,000 per year in 2018. SF Express, the first private air carrier company in China, focuses on the business to business (B2B) shipments with three wheeled vehicles handling the last mile Urumqi deliveries. Xinjiang is known as an oasis economy for agriculture harvesting of cotton and for fruits such as melons and grapes for raisins. SF Express has agriculture solutions to collect fruits from the distant countryside transported over highways to packaging warehouses to meet the business demand from the new city Urumqi residents and from all over the PRC. Additionally, the CNPC (China National Petroleum Corporation), the nation’s largest energy group, has announced the company is planning to invest more than 150 billion yuan ($22 billion) in Xinjiang. CNPC plans to build Xinjiang into the largest refining and chemical processing base in northwestern China, as well as the largest oil and gas import channel in the country. At present, CNPC has 15 large enterprises in Xinjiang and over the last five years, invested of 224.7 billion yuan ($33 billion) in the region.